We’ve developed one of the most powerful WordPress Plugins to save you TONS of time and ensure you won’t be SLAPPED by Google for missing important information (Copyright, Sitemap, Robots text file, Contacts, Location, Disclaimers, FTC Disclaimer, and all other VITAL Information) or forgetting to update your Copyright Year. Google rewards Websites that follow their guidelines! Let me say that again…”Google Rewards Websites That Follow Their Guidelines”! As one of the largest and favorite SSL Certificate retailers globally, Trustico® sets the standard in offering a high quality SSL Certificate service. Trustico® offers massive savings without compromising service or the security of your data. The same can’t be said for some of our competitors. We definitely don’t want to lose your business, so if you have found a cheaper price we’ll ensure to welcome you as a customer of Trustico® by matching the price you have found elsewhere. The YMYL YouTube Schema Markup Plugin allows you to easily add Structured Data to your site for YouTube Embedded Videos. Take advantage of adding Schema Markup to BOOST rankings on your YouTube Embedded Videos with this plugin. Search engines love Schema Markup on your site because it’s what their bots read and understand. 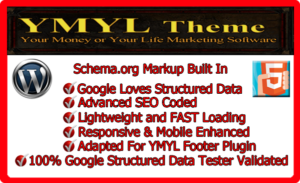 Finally, the Internet’s most advanced Schema.org Structured coded and Search Engine Optimized theme available today…The YMYL Schema Theme. This is an amazing new WordPress theme that you can easily setup and use for most all types of websites (for example: large and small business sites and blogs). At its foundation, the YMYL Schema Theme is built upon the most popular, safest, and advanced WP theme, Twenty Seventeen. Twenty Seventeen is a modernized take on an ever-popular WordPress layout — the horizontal masthead with an optional right sidebar that works perfectly for blogs and websites. It has custom color options with beautiful default color schemes, a harmonious fluid grid using a mobile-first approach, and impeccable polish in every detail. The YMYL Schema Theme will make your WordPress look beautiful everywhere. If you have ever setup WordPress sites you know how many different screens you must access… Click this, click that, change this setting, change that one… Total madness! Newbies are driven crazy and developers are spending way too much time answering questions. Imagine being able to click one place in the WordPress admin area, load a single screen and ALL the settings needed to launch your site are presented! 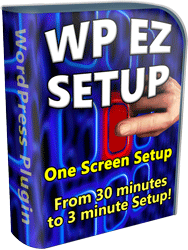 WP EZ Setup Plugin makes your life easier! Because it replaces the standard WordPress Setup procedure with its own; much easier and better one! After some trial and error, I came up with the perfect solution. That solution is WP EZ Setup Plugin! You or your clients can now setup WordPress easily and customize all the popular settings to your needs – QUICKLY.